Zinnias are wonderful annual flowers whose Mexican heritage is reflected in their bright colors, prolific bloom and ability to handle hot, dry summer weather. The common zinnia and its hybrid versions come in many sizes and flower types, making it a versatile addition to the home landscape. Fast growers and steady bloomers, zinnias are very care free. Because they complete their entire life cycle--growing from seed to mature plant, to flowering and then setting seed--in a single growing season and die when frost arrives, they are called annuals. Do not sow seed or transplant zinnia seedlings outdoors until nighttime temperatures are reliably above 50°F because they can not tolerate a surprise frost. Size: Zinnias come in many sizes. Dwarf versions are less than one foot tall; intermediate ones around 2 feet tall and tall types may grow to well over 3 feet tall. Plants may spread anywhere from 8 inches to 2 feet, depending on the variety. 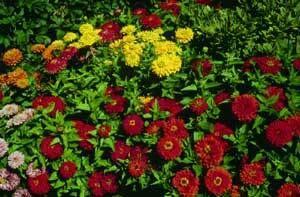 Foliage: As befits their hardy heritage, zinnias have coarse, rough, bold leaves that are slightly fuzzy. A medium green with smooth edges, they grow in pairs directly opposite from each other along the sturdy stems. Zinnias flower all summer and up until frost. Individual blooms range from a button-sized 1 1/2 inches wide on the dainty dwarf types to 4 1/2 inches across on the taller ones. Some of the new super tall types have flowers that measure as much as 6 or 7 inches across. Traditional zinnia blooms feature disks of compact, mounded rounds of tightly packed thick petals. They have yellow centers, which enlarge as the blooms mature. Flowers of hybrid forms may resemble tightly formed dahlia blooms or shaggy chrysanthemums. They may be ruffled or semi-ruffled. Others are double and still others are like daisies. 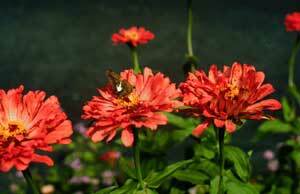 While zinnia flowers have no fragrance, they do offer an enormous range of radiant colors, except blue. Most common are the orange, red, white, yellow, and pink ones.